Welcome to the Billings Police Department Memorial page. We honor those law enforcement officers who gave their lives in service of the Billings community and vow not to forget them. 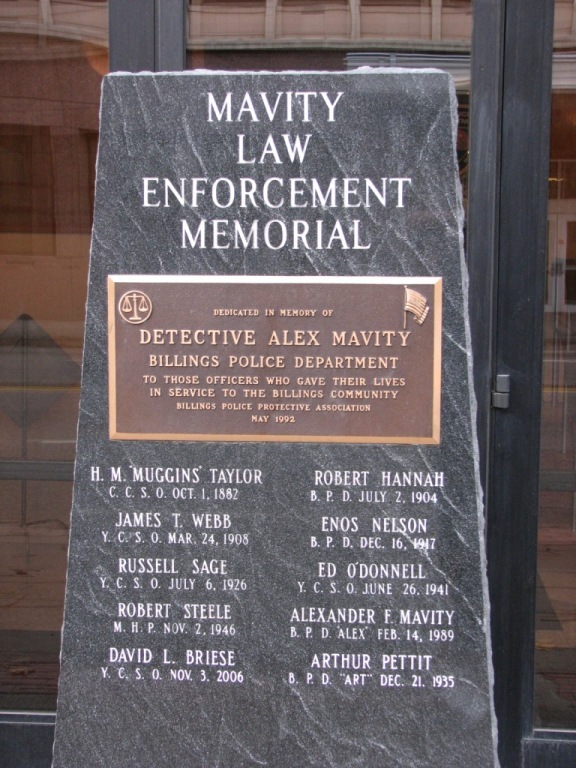 The Mavity Law Enforcement Memorial was dedicated in memory of Billings Police Detective Alex Mavity on May 1992 by the Billings Police Protective Association. The memorial stands in front of the Billings Police Department on North 27th Street. As we remember those fallen officers, we also remember their survivors. Concerns of Police Survivors, Inc., also known as C.O.P.S., is a nationwide non-profit 501(c)(3) organization providing resources to assist in the rebuilding of the lives of survivors of law enforcement officers killed in the line of duty. C.O.P.S. programs and services are funded by grants and donations. Also visit the National Law Enforcement Officers Memorial (NLEOM) for more information on the memorial honoring those who gave their lives. The following information is being used with permission from the Officer Down Memorial Page. Deputy Muggins Taylor was shot and killed while attempting to stop a drunk man from beating his wife at a local laundry in Billings. The suspect was apprehended and convicted of Deputy Taylor's murder, but he was pardoned 8 years later. Sergeant Hannah was shot and killed when he responded to a robbery at a local saloon. Two robbery suspects entered the saloon and gambling hall through a rear door. As they entered the building, two customers heard the commotion and left through the front door. The customers went to the police station and reported the robbery. The Yellowstone County Sheriff suffered a minor wound to his hand, however, Sergeant Hannah suffered from serious wounds and died later that day. Two suspects were arrested and confessed to murdering Sergeant Hannah. Sheriff Webb was shot and killed near Roundup, MT while attempting to apprehend a man for stealing horses. The suspect was later apprehended and killed by a posse. Sheriff Webb's funeral was attended by over 2,500 people. Policeman Nelson was shot and killed after responding to a report of a man with a gun in a bar. When Patrolman Nelson arrived at the bar, he discovered the male had left. Policeman Nelson exited the back door of the bar and was shot and killed by the suspect, who was hiding behind a fence. The suspect was later apprehended after a shootout and hanged. Sheriff Sage was shot and killed and a deputy was seriously wounded by a demented prisoner as they entered his cell. The suspect had a pistol that deputies failed to find when they incarcerated him the night before on a disturbance charge. The suspect escaped but was recaptured minutes later and charged with murder. Sheriff Sage had served as a sheriff for 5 years and had previously served 4 years as a police officer for the Billings Police Department. Patrolman Pettit was accidentally shot by another officer's gun. Patrolman Pettit was attaching a container to a fumigating device when another officer who was helping him bent down and his .38 caliber revolver slipped from his shoulder holster and hit the cement floor. The gun fired and Patrolman Pettit was hit by a bullet that passed through his stomach and liver. He was rushed to the hospital and doctors operated, but the wound proved fatal. He died the next day from the gunshot. Patrolman Pettit had served with the Billings Police Department for 19 years. He was survived by his wife and three children. Trooper Robert Steele was shot and killed while he and his partner investigated a vehicle which had just been used in a robbery in Billings. They observed a vehicle matching the description pull off Highway 10 and turn its lights off. Trooper Steele and a fellow trooper, riding together, pulled in behind the vehicle. Trooper Steele approached on the passenger side with his gun drawn. One of the occupants suddenly turned and shot Trooper Steele in the throat, killing him. Trooper Steele was a World War II veteran and had been with the agency for 6 years. He had returned to the highway patrol from WWII only 2 months before his murder. Detective Mavity was shot and killed while attempting to recapture a prisoner who had escaped his custody. Detective Mavity chased the suspect into an alley where the suspect was attempting a car jacking. Detective Mavity stopped the suspect and began to struggle with him. During the struggle both Detective Mavity and the suspect were shot with Detective Mavity’s service revolver. As a result, both Detective Mavity and the suspect died from their wounds. Detective Mavity had served with the Billings Police Department for 8 years and was survived by his wife, daughter, sister and parents. Deputy David Briese was killed in an automobile accident on I-90, near King Avenue West in Billings, while responding to backup an officer who was dealing with a combative drunk driver. Deputy Briese was passing another vehicle when his patrol car left the roadway, overturned, and struck a large sign. He was transported to Billings Clinic where he succumbed to his injuries a short time later. Deputy Briese had served with the Yellowstone County Sheriff's Office for 5 years. He had previously served with the Big Horn County Sheriff's Office for 1 year and the Yellowstone County Detention Facility for 5 years. He is survived by his wife, two young sons, stepdaughter, sister and parents.